It’s June already?. Was I stuck somewhere in time?. Well, the scorching summer will soon pave way to thunderstorm, rains, and lightning in this part of the world. 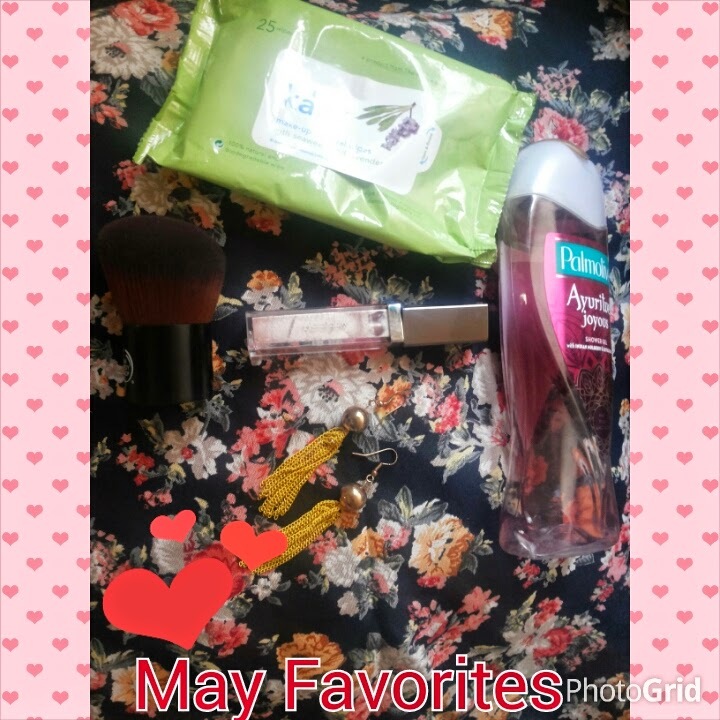 FYI: I hate the rainy season, well shifting our focus to something interesting and positive, lets’talk about MAY FAVORITES. Yay!!!! I have quite a few items in this post. Palmolive Ayuritvel joyous shower gel (Indian mulberry & lotus flower): I loved the original Palmolive Thermal Spa (Crushed coconut and jojoba butter extracts) and hated the Palmolive Aroma Sensual body wash (Moroccan rose essential oil and ginseng extract, it reminded me of cough syrup). I wanted a change in the usual shower routine and I liked the smell of this one. Now, I am literally using this 2 times every single day. Once I get used to the smell, I may roll back to the original love, but this shower gel is something I will come back to. Priced at Rs. 125 for 100ml ($2), this is an affordable, sweet smelling shower gel that stole my heart for the month of May. Neon earring: An absolute favorite in this summer month was this neon-golden earring from MAX for under $5. Faces Metalliglow Eye Primer: The original function for which this was purchased ie, as an eye primer, it never served the purpose. This as an eye primer, is too sheer and does not show up on my eyelids. After a little thought, I started using this as a liquid highlighter and it bowled me away. This works perfectly as a liquid highlighter on my NC 43.5 skin tone. A little dab dab dab on the bridge of my nose, on high points of my cheekbones, cupids bow and chin would give me that perfect JLow like glow. 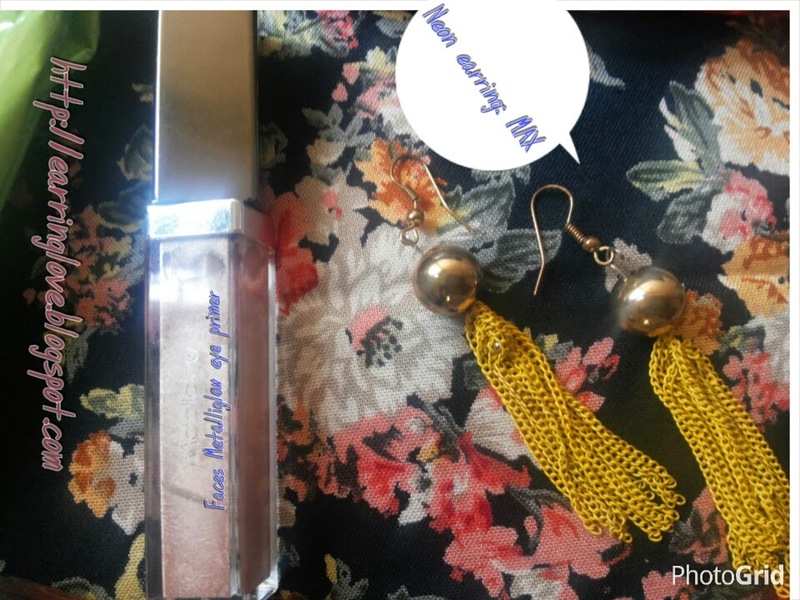 The highlighter is pretty sheer and hence can be layered thus making it an office wear highlighter. Priced at Rs.699 ($11) for 7ml. 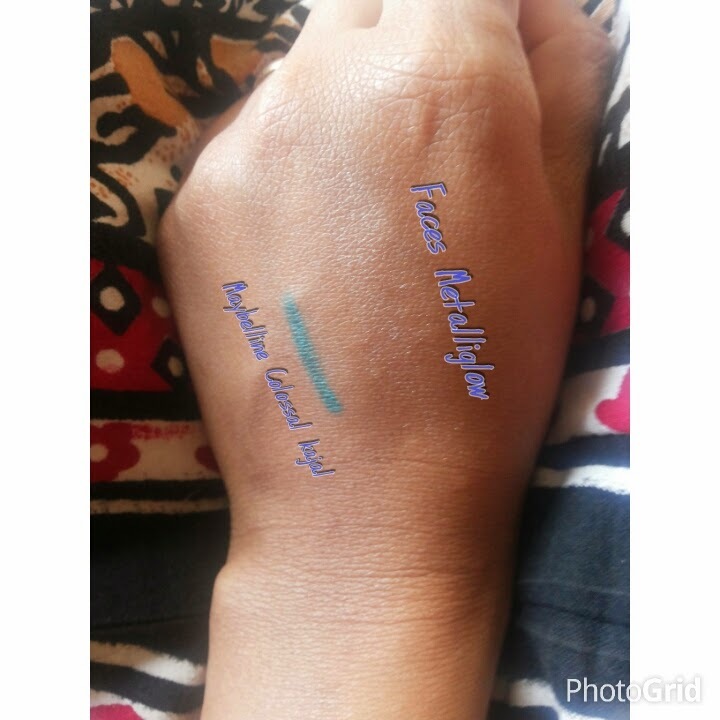 Maybelline Colossal Kajal in Turquoise: A summer staple, I have not kept this fun colored kajal down from the moment I bought it. Stays put (4-5 hours on me) and a light wash on the lower lashes provides perfect pop of color. Priced at Rs. 249 ($4). TBS Slanted Kabuki Brush : Any beauty blogger will tell you, how difficult it is to buy good quality affordable brushes here in India. When TBS was running a 50% off on their brush line, I purchased this brush. Originally I wanted to buy the TBS Extra virgin Minerals Foundation kabuki brush, but they were out of stock and I purchased this one after a little show down with hubby (You also might know how difficult its to convince the husband that you need another brush in your life?). I don’t regret purchasing this. The synthetic haired, cruelty free brush is thick and dense. The hair is really soft and does it's job perfectly. I use this brush as an overall face brush, to dust in little bronzer, with my studio fix powder, to blend in my contour, blush and highlighter. Its such a versatile brush. Priced at R. 1895 ($30), I got it for Rs.950. Insider tip: Purchase this beauty when TBS run their SALES. 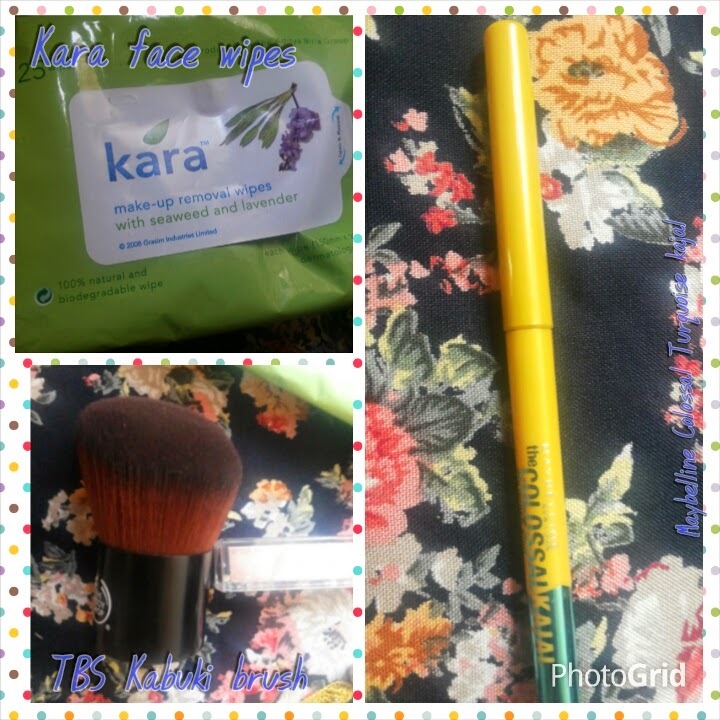 Kara Make-up Remover (with seaweed and lavender): I go through makeup removal wipes like nobody’s business (also shower gel). They are the cheapest and best quality available in the market . The Johnson baby wipes are a little too wet for my liking. When I rush to gym after my work, I use this to remove makeup from my face. It does a pretty good job (I don’t use water-resistant makeup and hence will not be able to vouch on its performance with water proof and water resistant makeup). It easily removes traces of my Colossal kajal, foundation and any other makeup. Always follow a proper face cleaning routine and never overly depend on the face wipes to substitute your CTM routine. Priced at Rs. 125 ($2) for 25 wipes. There goes my list of May Favorites. What are yours?. My Maybelline Colossal Kajal got over in May and I got the Lakme Eyeconic Black one. I have to say I prefer this to the Colossal one as it feels softer and glides on smoother, though the lasting power is pretty much the same. I think I'll give that shower gel a try! Nice to see another mallu blogger here. I prefer using the Lakme Eyeconic kajal over colossol as well, since it is softer and thus easier on the waterline, but thats just me. Thanks for the sweet comment on the blog. I am yet to check out the Ambika Pillai salon. I just followed you by the way, 2 more followers and you hate 50!! Yay to you..!! @beingFab..I love eye conic better :). Palmolive has amazing body washes. Do give em a try..you won't be disappointed.